The Nuclear bomb card can remove itself from the Leaderboard. 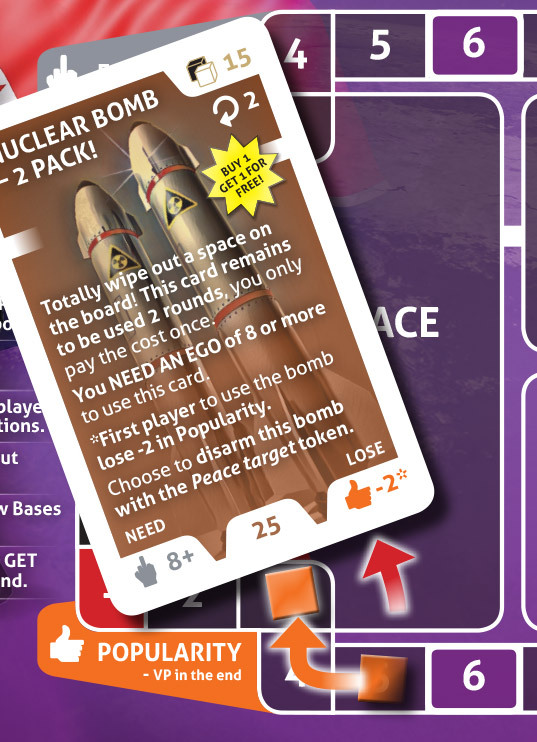 If the player are the first to fire the bomb, the player will lose 2 Popularity points. So by having 5 or less popularity points the cube get moved into the card space, removing the Nuclear bomb card. This is not a good strategy since the card can be used two rounds! 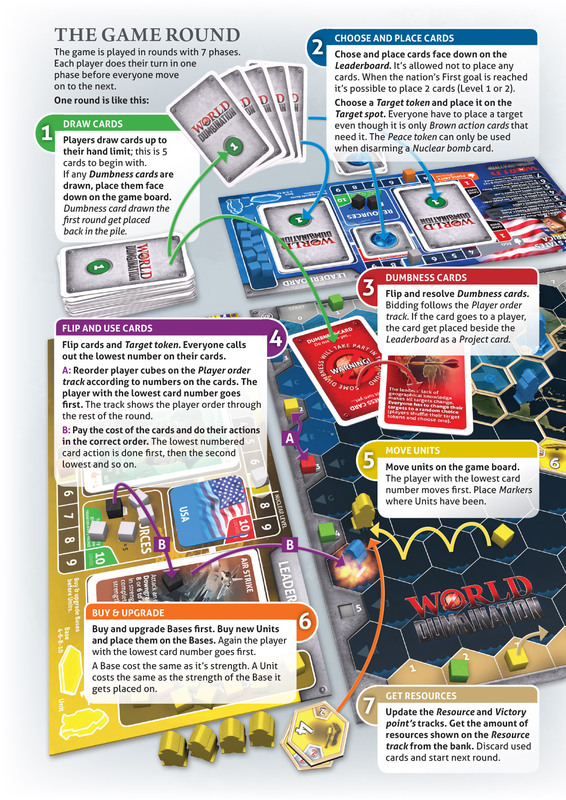 Cards are drawn and placed on player boards (called Leaderboards). The cards have numbers deciding the order of the players, and the order of the actions. Some cards have action you do to yourself to become more popular or get more ego. Some has actions you use to attack opponent’s projects, ego or popularity, but also opponents Units and Bases on the game board. This expands the use of the cards and makes the game more dynamic. There are also project cards that can hide movements of Units, or make you be able to move a whole Base closer to your opponents. There are 50 different cards in the game that adds a lot of fun to the game. The mechanic used on the game board is in a way very simple, but can also get a bit complex. Many play testers have put this as the favorite thing with the game as it is in some way unique. Your Bases on the game board have their own strength, this vary between 4 and 10. To make Bases stronger you need to upgrade them, this cost resources that you get from certain areas on the game board, but also from the Bases themselves. The Base gives strength to your Units (playing pieces) that you move around on the game board. A Unit that is placed on a Base has the same strength as the Base. The strength decreases for every space the Units move away from the Base that gives them strength. So to move freely around you need many small Bases, or a few very strong Bases. This mechanic can sometimes get a bit static, since Units often get stuck defending your areas. But this is where the card actions come in. Give your Units more strength, or attack opponents Units and Bases on the game board with Air strikes, Stealth missions or by all means, the Nuclear bomb! The positions on the board that can seem a bit static suddenly open up completely! The game is played in rounds with different phases. These are explained here in what maybe is the most important page in the rule book. There is not much unique with the how you win the game. The winner is the one with the most Victory points in the end. But you can also earn Victory points by disarm your nuclear bombs. So it is possible to win by making world peace! So the game has some deep strategy and difficult challenges. But the most fun with this game is all the weird things that happen in the game. Much of the credits for that are the Dumbness cards that get shuffled in the card piles. The cards get placed face down on the game board when drawn (these don’t show up every round). Players then know that the round is a “Dumbness round” where anything can happen. After players have placed their cards face down on the Leaderboards, the Dumbness cards get flipped and their action gets done, maybe doing a major f… up of your plans! Or you can be lucky and win the Nobel Peace Prize or get a bargain on a Trump card.